We’d love your help. Let us know what’s wrong with this preview of Memories of a Ghost by Joe DeRouen. Claire Summers awoke in a doctor’s office, heart pounding in her chest, blouse hiked up around her belly. She watched in confusion as a dark-haired woman moved an ultrasound paddle over her exposed stomach. “Claire,” said the woman, her badge identifying her as Dr. Greenwald, “your baby’s going to be okay.” She turned her head, scanning the room. They were alone. “I found Claire Summers awoke in a doctor’s office, heart pounding in her chest, blouse hiked up around her belly. She watched in confusion as a dark-haired woman moved an ultrasound paddle over her exposed stomach. “Claire,” said the woman, her badge identifying her as Dr. Greenwald, “your baby’s going to be okay.” She turned her head, scanning the room. They were alone. “I found the heartbeat,” the woman continued. “You were lucky this time. Your baby’s fine.” Claire? Is that her name? She doesn’t remember coming to see Dr. Greenwald, or even being pregnant. She doesn’t remember anything before waking up in the examination room, her life a complete blank. The only thing she really knows is that someone, somewhere is trying to kill her. To ask other readers questions about Memories of a Ghost, please sign up. I don't do this very often anymore, but I was given this audiobook in exhange for an honest review. I am a fan of the author, Joe DeRouen, so I already anticipated that I'd enjoy it. Either that, or I'd be incredibly disappointed and it would require me to unlike his fanpage and pretend he never existed in the first place. Okay, so I've been meaning to read this book for a while. And I planned on reading it when I acquired it. But I completely forgot that I had it already, because I'm horrible pe I don't do this very often anymore, but I was given this audiobook in exhange for an honest review. I am a fan of the author, Joe DeRouen, so I already anticipated that I'd enjoy it. Either that, or I'd be incredibly disappointed and it would require me to unlike his fanpage and pretend he never existed in the first place. Okay, so I've been meaning to read this book for a while. And I planned on reading it when I acquired it. But I completely forgot that I had it already, because I'm horrible person. But that's really beside the point. There's probably a note on one of my read-a-thon posts from last year with this book on it. I don't even want to search and find out, because there's too much shame involved. I really like how this author does paranormal. It's probably why I enjoy his books as much as I do. It's less vampires and whatnot and more actual demons that are going to cause some crazy damage if they're not stopped. Think an episode of Supernatural, except with a completely different set of characters - and before it became crazy ridiculous. Aka, good times. I was a bit confused a few times between the switches of characters. There is a lot going on, and a whole lot of people to keep up with. It really wasn't until a few chapters in that I started having an idea of what was going on in the book. Despite that issue, I felt the story had so much awesomeness that such insolence can be mostly overlooked. Like I mentioned, a bunch of stuff is happening. But it's all brought together in a way that I was both not expecting and pleased me greatly. And isn't that what matters in life? 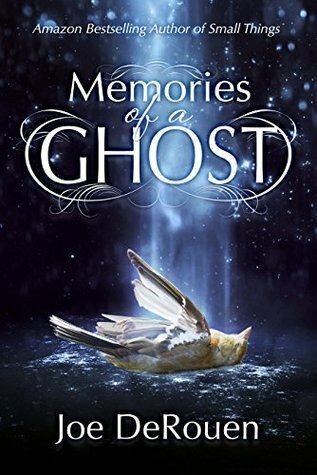 Memories of a Ghost by Joe DeRouen takes the reader on a whirlwind, yet contemplative, ride deep into the depths of zombies, ghosts, and the eerie time and space between this world and the next. The fast-paced novel starts with protagonist Claire escaping from a clinic after a sonogram because she is certain that someone is trying to kill her. She doesn’t remember who she is and sets out to figure out her life and save herself. She meets an African-American man wandering in the park and soon rea Memories of a Ghost by Joe DeRouen takes the reader on a whirlwind, yet contemplative, ride deep into the depths of zombies, ghosts, and the eerie time and space between this world and the next. The fast-paced novel starts with protagonist Claire escaping from a clinic after a sonogram because she is certain that someone is trying to kill her. She doesn’t remember who she is and sets out to figure out her life and save herself. She meets an African-American man wandering in the park and soon realizes he has been dead for decades. She discovers she can see ghosts and heal people. Leezie, her doctor and best friend, provides support, and Claire finds herself surprisingly attracted to her friend from girlhood. Little does she know that a group of teenagers “partying” that turns dark and ugly at a cemetery, and a pair of monstrous occult men taking possession of young, innocent Nadine, all coincide with her identity crisis. The book is exceptionally well-written: it’s colorful, vibrant, and fast-paced. The dialog is natural and distinct for each character. The characters are well-developed. Memories of a Ghost is quite a ride. It is full of surprising twists and turns that will keep the reader turning the pages. The best ghost story I've read in many years. A while ago, I reviewed another of Joe's books, Small Things. I loved it, so when he asked me to beta read his upcoming release, set in the Small Things universe, well, what's a guy to do? In case you don't know what beta reading is, it's the final phase of error checking before the book is finally released. So, I was pleasantly surprised by the quality of the manuscript. I am intensely pedantic, but the book read incredibly well. The story-line, howeve The best ghost story I've read in many years. The story-line, however, is where it's strengths lie. It gripped me by my neck and dragged me through so many twists and turns that I grew dizzy...that's quite hard to do, by the way. The characters, especially the ghosts, are incredibly believable. The story ends with...oops. I don't think I'm going to tell you. You'll just have to read it. Excellent read! Joe once again does not disappoint! I was lucky to win this book from Joe DeRouen at a Halloween Facebook event. If you think this is your standard ghost story then you will be completely wrong. The book introduces you to Claire who whilst having a pregnancy scan, loses her memory. Throughout this book, you get to know about her life and the relationship with her abusive husband and her best friend Lessie who happens to be a doctor. Thrown into the story are two teenagers, a geek named Farris and a popular girl Sabrina, who with the help of her zombie dad join up with Claire to battle against magical bounty hunters Mr Kingfisher and Mr Quarry. They have been hired to find Connor West. Just who and where is Connor West, well you just have to read the book. The characters are believable and whilst you are reading this book you will catch yourself saying "oh no" quite a lot. Each character's storyline gets you to understand the bigger picture. Yes at the beginning you think to yourself " how does this all connect, but as you carry on reading it, it all clicks into place. The ending was a nice surprise and competed this book. The way the book is written you feel that you are there, but do you really want to be. Think of the Apocalypse, with its mixture of action and supernatural and this is a must read book. I've been so busy, it took me a while to read this book. This is one of the few times I didn't mind. Memories of a Ghost sucked me into a world that I didn't want to leave. It's difficult for indie authors to get a name because people simply don't want to give them a chance. If you only give one indie author a chance this year, give to Joe. I honestly don't know how he doesn't have publishers stalking him with a contract. This book isn't just about a woman with amnesia. This is a book about the I've been so busy, it took me a while to read this book. This is one of the few times I didn't mind. Memories of a Ghost sucked me into a world that I didn't want to leave. It's difficult for indie authors to get a name because people simply don't want to give them a chance. If you only give one indie author a chance this year, give to Joe. I honestly don't know how he doesn't have publishers stalking him with a contract. This book isn't just about a woman with amnesia. This is a book about the world in despair and people don't even realize it. This is an amazing paranormal book that is an entire world in itself. There are crazy men torturing people and eating spirits, a couple teenagers and a zombie trying to stop it all, and a woman named Claire who doesn't understand how she fits into the equation, but she knows something is going on that she is somehow a part of. This book has everything. It reminded me of something Stephen King would write, and has a huge King fan, I couldn't have been happier. Joe has a bright future ahead of him as an author. He better not ever stop writing. I give this book 5 giant stars! "Memories of a Ghost" is an intriguing dark tale of ghosts, zombies and an abundance of supernatural happenings. Hard for me to stay on top of who was who and various storylines that took a bit too long to connect for my taste. Guess I was thinking it would be more like Small Things and Threads. Glad I stuck with our till the end because it wrapped up nicely.